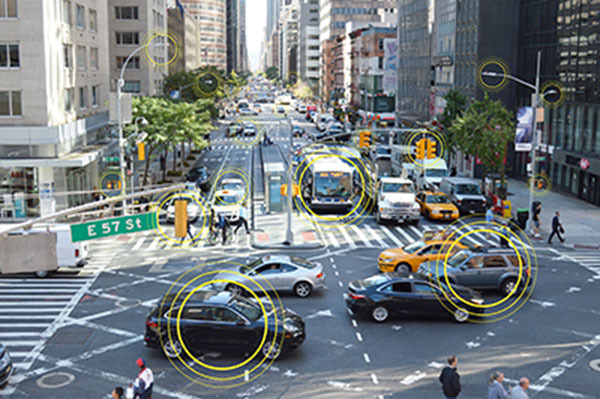 The New York City Department of Transportation (NYC DOT) announced today it has advanced to phases 2 and 3 of the Connected Vehicle Pilot program. Managed by the United States Department of Transportation (U.S. DOT) Intelligent Transportation Systems Joint Program Office (ITS JPO), the Connected Vehicle Pilot Program is a national effort to deploy, test, and activate mobile and roadside technologies and enable multiple connected vehicle applications. The pilot is focused on developing and deploying more than 15 safety applications to provide in-vehicle warnings to motorists behind the wheel. Phase 2 consists of a 20-month period of activity to design, build, and test the wireless in-vehicle, mobile device, and roadside technologies. This will be followed by phase 3, an 18-month evaluation period where the effectiveness of the deployment will be tested. Both phases 2 and 3 are being carried out thanks to a $18.6 million award from the U.S. DOT. Phase 1, which began last September, consisted of a 12-month period of concept development and implementation. NYC DOT will install Vehicle to Vehicle (V2V) technology in up to 8,000 vehicles, including cars, taxis, trucks, pick-up trucks and buses, as well as infrastructure as part of the Vehicle to Infrastructure (V2I) portion of the pilot throughout Midtown. This includes upgrading traffic signals with V2I technology along First, Second, Fifth and Sixth Avenues between 14th Street and 66th Street in Manhattan and on Flatbush Avenue from the Manhattan Bridge to Prospect Park in Brooklyn. Additionally, roadside units will be equipped with connected vehicle technology along the FDR Drive between 50th Street and 90th Street. In addition, NYC DOT is currently evaluating vendor proposals for mobile wearable devices as part of the pilot, as well as a mobile app that will provide intersection movement guidance for visually impaired pedestrians. During phase 1 of the pilot, NYC DOT prepared a comprehensive deployment concept to carry out a connected vehicle program roll-out involving up to 8,000 vehicles. This included testing of technologies developed by vendors at the Aqueduct Race Track this past July. These connected vehicles will yield unprecedented levels of anonymous data that will be the basis for innovative applications that will lead to smart vehicles, smart infrastructure, and ultimately smart cities. NYC DOT is participating in the Connected Vehicle pilot as part of Vision Zero, the Mayor’s commitment to improve street safety in every borough across New York City. For more information on the Connected Vehicle Pilot Program, visit the U.S. DOT website.